One of the attractions of walking as an activity is that you can do it virtually anywhere. Many people might not consider themselves ‘committed’ walkers in the truest sense of the word but they’ll still walk regularly even if that just means a quick walk to the shops or a 20 minute stroll around their local park or playing field. For those who prefer their walks to be more structured, however, there are literally hundreds of walks which can be categorised. These are trails in England and Wales which have been officially recognised, managed and designated ‘National Trails’ by either the Countryside Agency or the Countryside Council for Wales. They include some of the most famous, most traversed and well-loved routes in Britain, passing through areas of outstanding national beauty with plenty to see and do along the way. They are all waymarked using an acorn as their symbol and have all been written about extensively with numerous guide books published to help you on your way. Some of these trails are outlined in greater depth on other links contained within this website. Waymarked using a thistle as their ‘emblem’, these are Scotland’s equivalent to National Trails. They are the responsibility of the relevant Scottish local authorities through which the routes pass and have also been chosen because they pass through areas of outstanding national beauty and interest. You can read more about one of these routes, the Great Glen Way, on another link contained within this website. In addition to the aforementioned trails, there are many more waymarked routes for you to walk. More often than not, they’ve been created by local authorities alongside help from local Ramblers’ groups and other keen walkers who have banded together to look after and maintain them. They come in all manner of styles and distance – from shorter health walks to long distance treks but each route is waymarked throughout with its own logo to ensure you can keep on the right path. These are some of the ‘hidden treasures’ when it comes to walking. 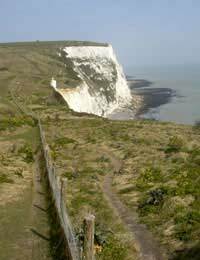 Not waymarked or the responsibility of any specific organisation, these are walks which have been publicised in books or online as routes that might be of particular interest to walkers, yet are not officially designated trails. One of the more famous of these types of route is the ‘Coast to Coast’ walk in Northern England which was conceived by Alfred Wainwright, a well-known writer and hill walker, and which connects the Irish Sea to the North Sea on the eastern coast of England and crosses 3 National Parks along its path. Of course, there are many other walking routes which remain relatively unheard of, unless you’ve specifically come across them yourself, yet there are plenty of resources both in print and online to help you to discover them for yourself. Your local authority’s website and your local Ramblers’ Association group, if you have one, will also give you useful advice on walks of interest that you can undertake within your locality. So, whether it’s a stroll in your local park to a full-on Land’s End to John O’ Groats ‘marathon trek’ you’re interested in, you’re bound to discover new and exciting walking routes for you to enjoy.